It was the first day of our adventure, we had our breakfast from the hotel and went straight to our first destination – Gyeongbokgung Palace. I found this palace from the travel book that I bought when I was in Sydney. The book titled “Top 10 Seoul”. We arrived at the palace by taking metro train from hotel. From Non-hyeon station, we took Line 7 going Bupyeong and went out at Express Bus Terminal station, then we transferred at Line 3 going to Daehwa and get off at Gyeongbokgung station. We felt excited seeing some of the photos of the palace on our way. We passed the National Palace Museum and walked at the side gate (Yongseongmun) of the Palace from the Museum. We saw a lot of tourist taking pictures and I felt great to be in this place. My mom and my sister immediately posted their selves for a photo shot. I am the one who brought the DSLR camera, and most of the time I am the one who take pictures which I like because I wanted to capture a lot of things if possible, everything that my eyes see. When we entered a small gate at the left side of the palace, we saw a ceremony that was being performed. Though I never understand what was happening at first until I learned it later of the day that it was the Gwanghwamun Gate Guard-on-Duty Performance. We enjoyed the show because of the colorful costumes the royal guards re-enacting the performance. We went to the tourist ticketing area, we bought ticket and brochure guide that we need in our tour. From the guide in my hand, I learned that the main gate is called Gwanghwamun. Based from history this gate is the main gate and south gate of the palace. The next gate we passed is called Heungnyemun (first gate inside the palace walls at the front). This is the gate where tickets are being checked. We saw a small bridge called Yeongjegyo. We walked again until we reach another gate which is called Geunjeongmun. Finally we saw the huge hall named Geunjeongjeon. Based from our brochure, this is the main throne hall where most of the King’s official state affair is happening during Joseon dynasty. Next buildings we saw are just behind of Geunjeongjeon is Sajeongjeon. As far as I remember, the middle of the building are still in restoration. While its side building on the west is Cheonchujeon and on the east is Manchunjeon which seems completely restored, while long corridors that connects these two side buildings to Sajeongjeon is not yet rebuilt. Then we moved to the famous building near the lake called Gyeonghoeru Pavilion. This is the place where most of the banquets in the palace were happened before. This is the famous place where most of the Historical drama of Korea were shot. The settings of the Pavilion is somewhat romantic, it is great scenery where the King and its lovers (either the queen or concubine) probably had a great time for themselves. We walked outside the wall of the Pavilion until we saw another gate leading to an open space with mountain. I really like the place, I can understand why the royal family has palace located on this place, for me its a great place for great view of the mountain. We walked straight until we saw the Janggo. Here we found a lot of Jars seating on the terrace. The jars contain fermented paste and soy sauce which is the traditional way of fermentation in South Korea. At the front of Janggo, there is a nearby building and its vicinity called Hamhwadang and Jipgyoengdang. Based from the information of my handbook guide, that this place is the queen’s living quarters, residence known as Heungbokjeon and facilities for concubines and court ladies. We moved on to the next vicinity in the palace until we found a square pond called Hyangwonji and we saw islet in the middle of the pond and there standing the small pavilion called Hyangwonjeong. The setting of this place for me is similar to Gyeonghoeru pavilion, very romantic. While reading the guide, I realized that this small pavilion is the place where Queen Myeongseong (queen of King Gojong) killed by the Japanese. We went next to Jibokjae and its vicinity area. This the place where you can find building with the design of Qing Chinese style. 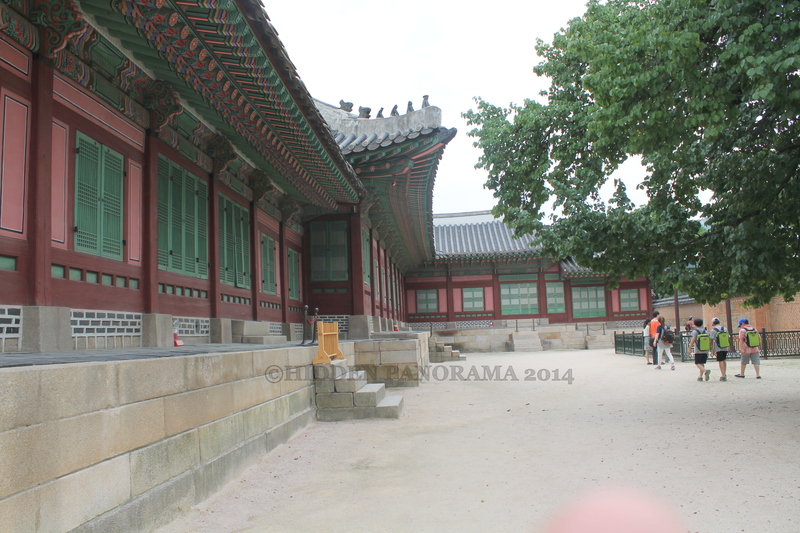 Jibokjae was moved from other palace (Changdeokgung) after King Gojong returned to Geoncheonggung. Jibokjae has become King’s residence, library and reception hall for foreign envoys. There is one of the two vicinity areas that we missed to visit. One is Taewonjeon. We passed this one because we thought that another ticket is needed and there are still other parts of the palace that we haven’t seen. That’s why we decided to come back there if we still have time but unfortunately, we were not able to come back. After Jibokjae area, we went to the vicinity area just beside the pond. It is called as Geoncheonggung, they say that this building is the only building with “gung” on its name which means palace, that is why they call it as palace within the palace and this is King’s Gojong’s residence where both the King and Queen has their own quarters and library. Beside the Geoncheonggung, we found another interesting site which is called Jaseondang, which is a residence of the crown prince and princess. We saw the site because the building was destroyed, as per handbook the building was dismantled and brought to Japan, then returned to Korea, but the materials were not usable anymore to rebuilt or restore the building. Aside from Jaseondang site, we also found another site which is called Gwanmungak. This is the first modern building in Korea but has been destroyed as well when Japanese invade Korea. We continued our stroll inside Gyeongbokgung Palace, until we found another vicinity called Jangyeongjeon. This was the residence of Queen Dowager Jo. She is the queen who put King Gojong as the king, she is also a regent at that time when King Gojong was still young. From this location you can see from a far the National Folk Museum. Next vicinity we passed by are Gangnyeongjeon and Gyotaejeon. Gangnyeongjeon is the King’s living quarter, where he reads, rest and sleep, while Gyotaejeon is the queen’s main residence. In the same vicinity we found as well the Amisan garden with beautiful chimneys. And then we looked around the area of Heumgyeonggak and Hamwonjeon. This area serves as building for most of the royal household, scientific inventions can be found here during Joseon dynasty. The second vicinity area that I think we missed to see is Donggung. I checked all the photos that I have and it seems we never been there, but I recall that there is ongoing renovation happening beside Gangnyeongjeon where Donggung is nearly located. We went back where we started our tour and took a lot of photos. Another area we found is Sujeongjeon where there is a nearby restaurant and wash room. Based from Handbook, that Sujeongjeon was formerly known as Jiphyeonjeon or Hall of Worthies where the Hanguel, the Korean Alphabet was invented under King Sejong. With the three of us, my mom, my youngest sister and myself, I enjoyed the whole walking tour. Maybe because I was fascinated with Korean History and I can relate because of so many historical dramas that I watched. I felt like it is a living history, though I am aware that most of the buildings are restored or rebuilt because most of them has been destroyed either by fire or by Japanese invasion. But still, the replica is so detailed that you can feel those buildings and structures are for real. I am excited to see the another palace. We went outside the Gyeongbokgung Palace through Gwanghwamun gate and we cross the road and walked in the middle of Sejong-Daero road and there we found the Sejong Center at the ground floor. Because we are quite tired walking for long hours inside the palace, we walked a little bit to see what’s inside the Sejong Center. And there we found a lot of things about King Sejong, though I am familiar that King Sejong is the king of Jeoson where the Korean Language and Alphabet had been invented, for what I know, King Sejong is one of the Great King that South Korea is recognizing today. I remembered that I watched two historical dramas during his reign, one is Deep Rooted Tree and one is Sungkyunkwan Scandal.